William James Lowe was born in the Old Post Office, next to the Victoria Hotel, on 28th November 1889 to William John Lowe and Selina Lowe (nee Horton). He was baptised on 1st February 1890 in St Ann’s Church. 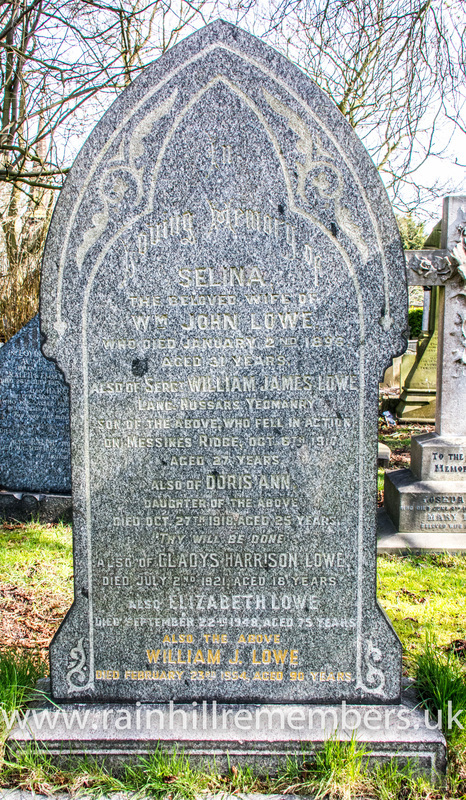 Selina died in 1896, when he was seven years old. In the presence of: - William Layhe, Arthur Henry Layhe and Doris Ann Lowe. 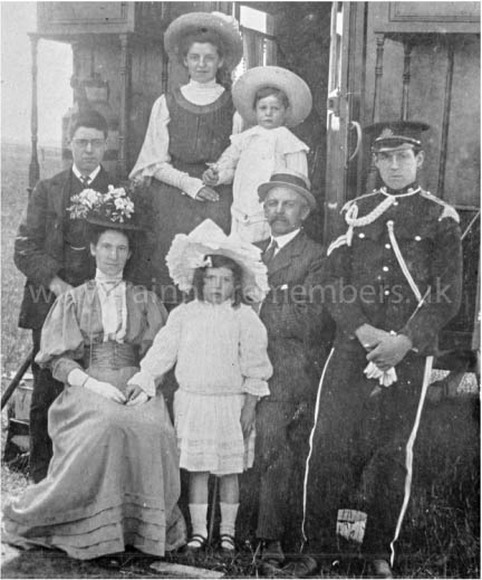 Their daughter, Selina was born in the spring of 1916. Annie Louisa died in September 1977 in Blackpool. Sometime in the early part of the 1900’s, William James joined the Lancashire Hussars Yeomanry, a Territorial Unit. He served as Sergeant 339. By the time war broke out in 1914, he was already a Sergeant and was quickly mobilised and moved to Kent. Sgt. Lowe probably served with “D” Squadron of this regiment, and went to France with his unit on 9th November 1915, attached to the 2nd Indian Cavalry Division before the three squadron’s (”B”,”C” and “D”) re-combined in May 1916. Sergeant Lowe was also numbered 250038 with the Yeomanry. This number was allocated when the Territorial Force was renumbered in March 1917. In July 1917, the Regiment was dismounted and dispatched for training as infantry which was completed by September. On 24th September 1917, a draft of 16 officers and 290 men of the Lancashire Hussars, including Sgt. Lowe were posted to 18th Battalion of the King’s Liverpool in the Torreken Farm area of Wytshaete. They were amalgamated into the 18th Battalion which was then renamed the 18th (Lancashire Hussars) Battalion, King’s (Liverpool) Regiment. At this time, the 18th Battalion was heavily involved in the Third Battle of Ypres, better known as Passchendaele. Sergeant William James Lowe – 300306, The Kings Liverpool Regiment, 18th Battalion was 'killed in action' on 6th October 1917, aged 27. He has no known grave and he is remembered on the stone walls of Tyne Cot Cemetery, Belgium which makes up the Memorial to the Missing. Medal Entitlement:-1915 Star, British War Medal, Victory Medal. 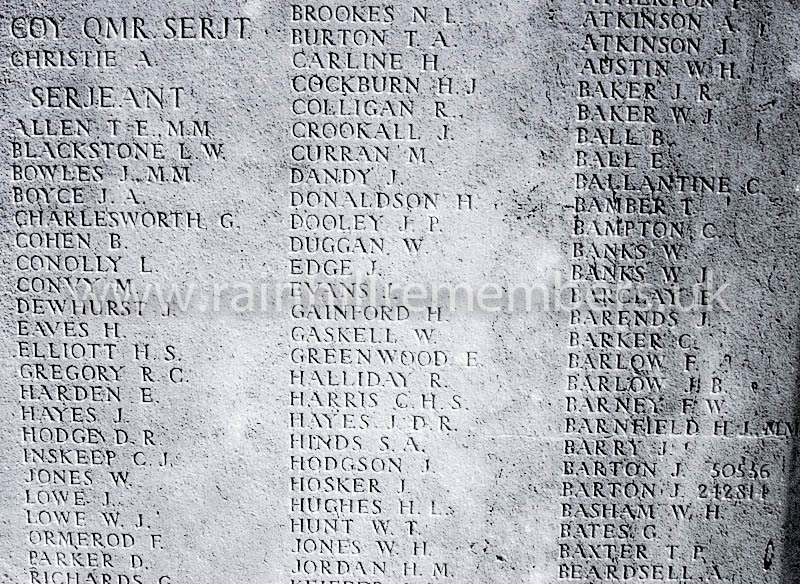 The Tyne Cot memorial wall where Sergeant William Lowe's name is inscribed in the Kings Liverpool Regiment section.